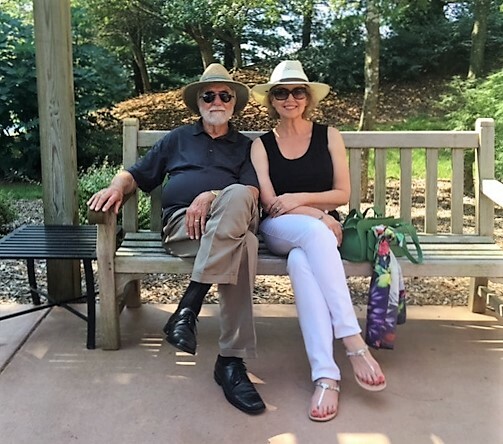 After a long day of attending the car show and exploring the area, we dressed for another excellent dinner at the Harvest Grill located on the grounds of Shelton Vineyards. Behind me above is the stage area on the vineyard. Live music performances are held here every year. My Prince and chariot await! We watched the sunset over the vineyard from our table by the flower gardens. Grouper was the evening's special. We enjoyed another perfect evening at the Harvest Grill! My travel bag held all of the pieces I own from my clothing line for this trip. This evening, I wore the thin strap tank dress that first convinced me I needed to locate this line and offer it to you. 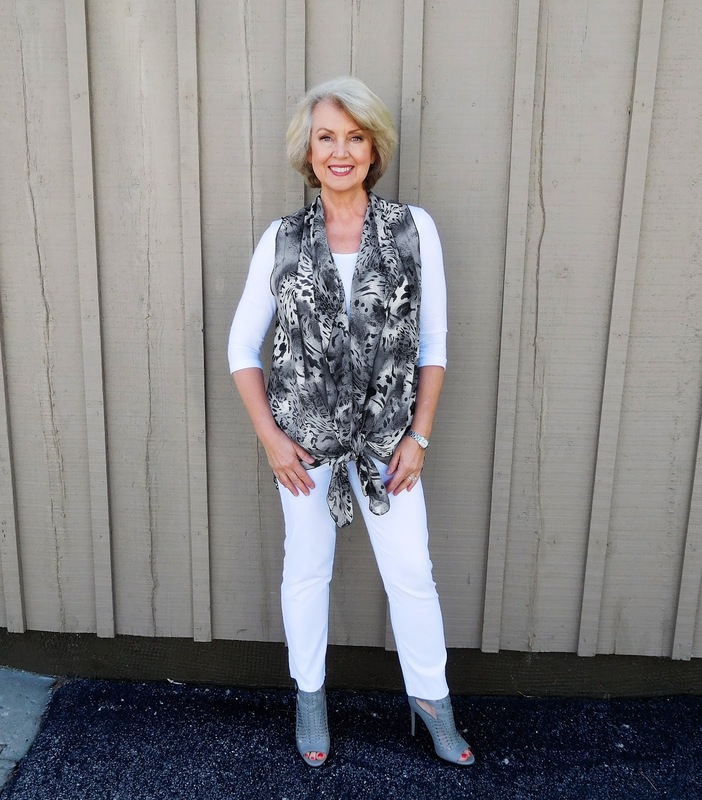 The white linen biker style jacket is old. I found it on a sale rack at Stein Mart a couple of summers ago. When we arrived, I took everything out of the bag and hung it up. After a few hours, it didn't even need steaming. The pieces interchanged with all the other items I brought perfectly. I kept the palette simple with black and white pieces, but I have never felt more confident and comfortable on a trip. I packed several scarves but only used the silk shawl in yesterday's post due to the heat. Scarves take up no space in your luggage, but they can significantly change the look of your basics. Upon my return home, I machine washed all the pieces in cold water and hung them on a felted hanger to air dry. They turned out beautifully and ready to pack for another trip! A Mercedes-Benz car show was held at Shelton Vineyard on Saturday. We made a whole weekend of it! The vineyard is located in Dobson, North Carolina. We thoroughly enjoy our visits there. Dinner at the Harvest Grill is always a treat! The food and service are top notch. I had the pasta because I wasn't very hungry. Have you noticed that pasta seems to grow? On our first evening away, I wore the black lace sleeve tunic with the black straight leg pants from my collection to dinner. These pieces pack beautifully and are very lightweight as well as super comfortable. The color is black but it appears navy in this lighting. The necklace is from French Kande. The bag is old from S.M. Bradford in Hilton Head, South Carolina. The shoes are old from Calvin Klein. This blush jacket was added to my collection several months ago. It has surprised me how well it works with all my neutrals. White jeans and a tank can be a perfect base for you if you wear white near your face and you don't mind white pants. Inverted triangle body shapes love the balance that comes from wearing white pants with a darker top. I wear white jeans all year round if the weather is dry. That rule about not wearing white after Labor Day has been put to rest. A third of my wardrobe is white, so I wear it often. It is the fabric that we need to think about during cold weather, not the color. I wear heavyweight white jeans in the dead of winter because they are as warm as any other denim. Perhaps cream would be a better option for you, but one color of top and bottom with a contrasting color over it can be very slimming. It is always an effortless way to get dressed. Wearing a light color in hot weather helps to keep me cooler. It may be a sheer cardigan or vest that becomes my third layer in summer, but a column of color works well for me. The beauty of a column of one color with accents of another is that getting dressed is a snap no matter where you are going. Great fitting white jeans or jeans styled pants such as these by Fabrizio Gianni are worth the investment. I have worn these often for over two years, and the fit stays true after every wash.
Pocket placement is crucial in the jean design. If the pockets are in the wrong place, they can accentuate the parts you may not want to, and they can make you look wider than you are or bring attention to the fact that your bottom is lower than it used to be. Always take a look in a three-way mirror before you buy jeans. I never wear embellished or torn jeans. Someone asked me about rules for wearing belts recently. I do wear them but with limitations. I would never in a million years tuck a top into a pair of jeans and wear a belt at my natural waistline. Your natural waistline is where your body bends when you move from side to side or bend over. Mine is very high, so that means I have a short waist. I can only wear a belt with a partially tucked in top and lower rise pants. Alternatively, I can wear a low-slung belt over a tunic to mimic a lower waistline. To make your short waistline look longer, wear a belt the same color of your top. If however, you have a long waistline, wear a belt the color of your pants. The blush jacket is old from White House|Black Market. The tank top is from Chico's. The pants are by Fabrizio Gianni. The bag is from Express. The shoes are old by Sam Edelman. I am so excited to announce the arrival of the new animal print vest from Covered Perfectly! 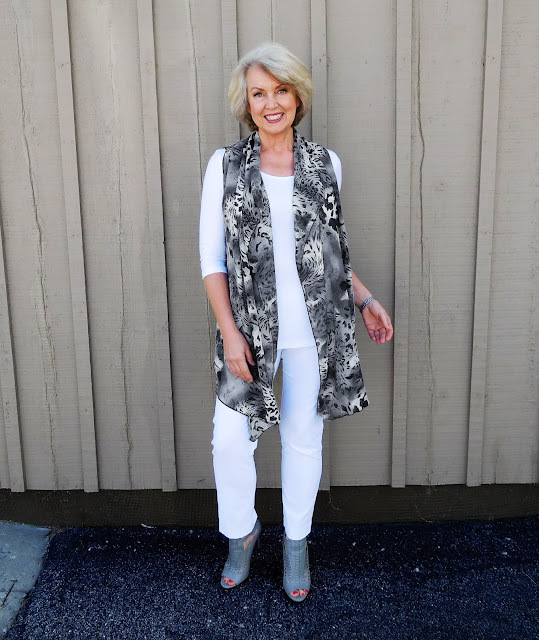 I have worn these vests in many different ways in several videos and here on the blog. I love the versatility of this great piece, so I always take one with me when I travel. I got so many compliments when I wore this one last Friday. 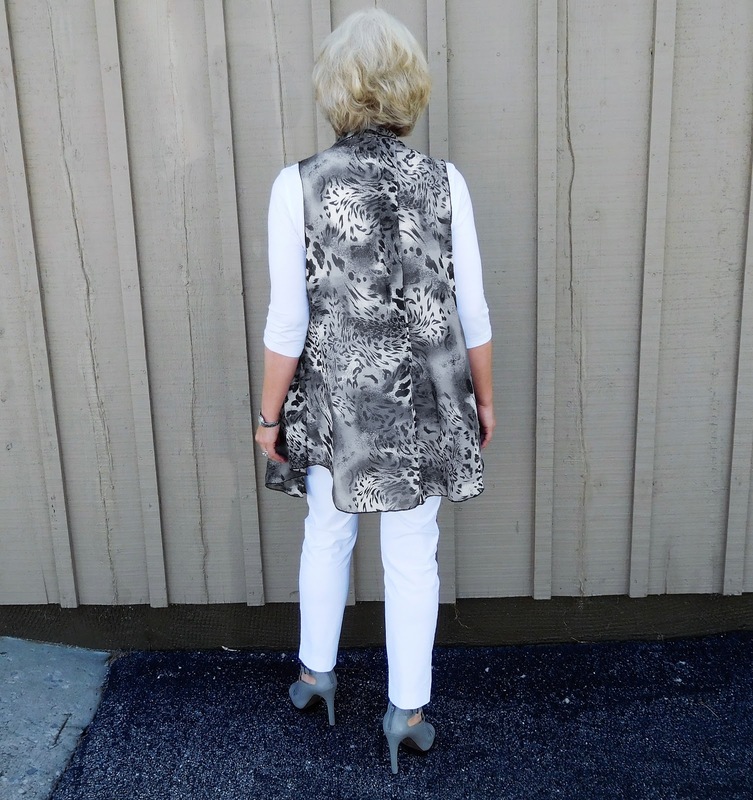 These vests can be worn tied, belted, layered, as a scarf and even as a blouse. They have been a lifesaver for me during the heat of this summer because they hide my least favorite parts but they are light as a feather. These cascading vests look great worn with any of the simple comfort tops, but I have also worn them over dresses and even a bathing suit as a cover-up. This new style just arrived so grab yours before they sell out. These prints are often limited editions. A few of my favorite online places to shop, graciously allow me the option of offering you a discount. Covered Perfectly generously offers Fifty, not Frumpy followers a 20% discount on up to two items! Use the discount code FNF20 when you check out at Covered Perfectly. There are several great new styles to choose from, and the discount will apply on up to two items, or you can take advantage of the buy two get one FREE special! Only one of these offers will work per order. Many have asked how my style will change in my seventh decade. Owning lots of items isn't appealing to me anymore. For example, I much prefer to own three or four excellent quality bags that are the correct size and shape for my body. Style experts tell us that matching your handbag to your shoes, ages you ten years. Scarves soften my neckline and take the emphasis away from a less defined jawline. They add a punch of color and pattern to my classic neutrals and keep me warm. You will find many beautiful scarves here. Three-quarter sleeve jackets are perfect for the transition seasons. I have blue, black and white ones for this reason. The jacket, tank, and straight leg faded jeans I am wearing are all old from White House|Black Market. The shoes are old by Dolce Vita. Straight slim leg pants with a jacket will still be my uniform because that silhouette flatters my inverted triangle shape. The scarf I am wearing here is about five years old. I have worn it countless times. If the weather is too hot for a scarf, you will see me switch to only a necklace. If I am wearing the scarf just draped around my neck or under the lapel of my jacket to give my look pattern and color, I may also wear a necklace. I never tie my scarves in a complicated way, and I try to achieve straight lines or a V-neckline with them. Many styles of scarves are here on my shopping site. I will continue to be willing to try new things. This year I discovered that I like the slimming effect of a short jacket over a longer top. The learning never stops! An open mind tempered with wisdom can be an important attribute. There is indeed an art to aging well. A wardrobe of great looking sunglasses is necessary for me. I wear them every day. The last item I agreed to review for the blog arrived this week. I loved it so much I immediately bought the black one and a silk scarf from Uno Alla Volta. If you don't know of this company yet, they have the most amazing collection of unique items I have found. Their name means one at a time® and describes how their artisans lovingly create each treasure. Taking things uno alla volta is at the core of their philosophy for living a meaningful life. The bag I fell in love with is by Alessandra. She handcrafts each ''borsa verde'' or green handbag, uno alla volta, at her workshop in Florence, Italy. Born into the leather craft business, Alessandra has the highest standards for materials, workmanship, and style. Certificate of authenticity is included. My philosophy in my sixties will continue to invest in quality and enjoy it every day. You have earned it! I no longer accept products in exchange for reviews. This bag was sent to me by Uno Alla Volta.